One of the advantages of code generation is the ability to see how a specific language feature or framework is used. 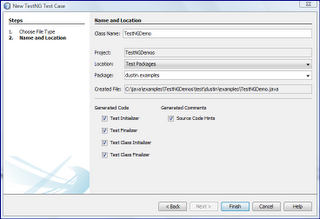 As I discussed in the post NetBeans 7.2 beta: Faster and More Helpful, NetBeans 7.2 beta provides TestNG integration. I did not elaborate further in that post other than a single reference to that feature because I wanted to devote this post to the subject. 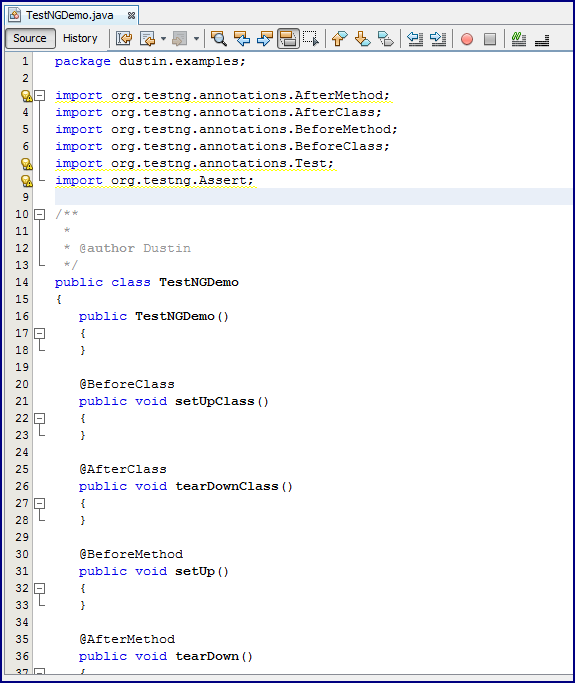 I use this post to demonstrate how NetBeans 7.2 can be used to help a developer new to TestNG start using this alternative (to JUnit) test framework. 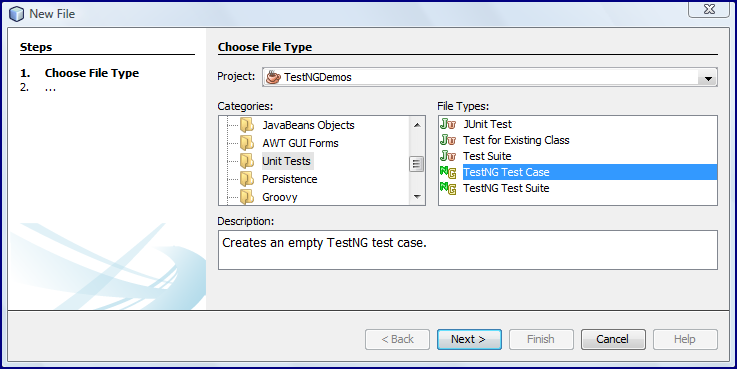 NetBeans 7.2's New File wizard makes it easier to create an empty TestNG test case. This is demonstrated in the following screen snapshots that are kicked off by using New File | Unit Tests (note that "New File" is available under the "File" drop-down menu or by right-clicking in the Projects window). Running the TestNG test case creation as shown above leads to the following generated test code. 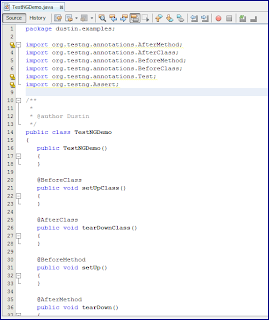 The test generated by NetBeans 7.2 includes comments indicate how test methods are added and annotated (similar to modern versions of JUnit). The generated code also shows some annotations for overall test case set up and tear down and for per-test set up and tear down (annotations are similar to JUnit's). NetBeans identifies import statements that are not yet used at this point (import org.testng.annotations.Test; and import org.testng.Assert;), but are likely to be used and so have been included in the generated code. I can add a test method easily to this generated test case. The following code snippet is a test method using TestNG. This, of course, looks very similar to the JUnit equivalent I used against the same IntegerArithmetic class that I used for testing illustrations in the posts Improving On assertEquals with JUnit and Hamcrest and JUnit's Built-in Hamcrest Core Matcher Support. The following screen snapshot shows the output in NetBeans 7.2 beta from right-clicking on the test case class and selecting "Run File" (Shift+F6). 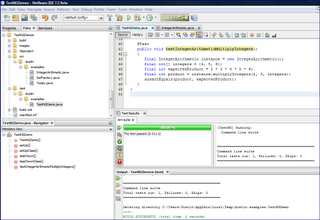 The text output of the TestNG run provided in the NetBeans 7.2 beta is reproduced next. 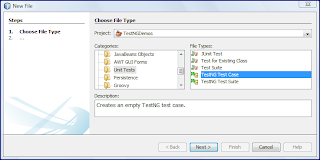 The above example shows how easy it is to start using TestNG, especially if one is moving to TestNG from JUnit and is using NetBeans 7.2 beta. Of course, there is much more to TestNG than this, but learning a new framework is typically most difficult at the very beginning and NetBeans 7.2 gets one off to a fast start.